3 piece car care kit included. A premium, heavy duty pressure washer, the STANLEY 1800-PSI electric pressure washer offers a best-in-class design and features that are ideal for tough jobs around the home including washing patios, decks, cars, driveways, and siding. The 20 ft. high pressure hose, 35 ft. cord and high impact wheels provide mobility and increase ease of use. Other notable features on this STANLEY pressure washer include a variable nozzle, turbo nozzle, soap dispenser and reservoir, flat brush, quick connector, and an integrated high-pressure hose reel with folding handle. The all-new K1900 was developed to offer premium cleaning performance and unparalleled ease of use. This electric pressure washer delivers 1900 PSI of TruPressure, ensuring you get the highest level of cleaning power and driven by a rugged induction motor. It includes convenience features such as a unique on/off foot switch, a handy storage bin, large one-gallon removable detergent tank and four spray nozzles (including a turbo nozzle for intense cleaning). Metal hose connections, oversized no-flat wheels and an integrated aluminum frame make this unit highly durable. Universal quick-connect nozzles and standard M22 hose connections simplify nozzle and accessory usage. Best of all, no tools are needed for assembly you can set up and start using the K1900 in five minutes or less! When you're done cleaning, simply fold down the handle for compact storage. Backed by a three year limited warranty, the K1900 electric pressure washer is perfect for tackling those deep cleaning jobs. Powerplay PressureJet 2050 is built using best-in-class components that can withstand rugged use from any dirty job you throw its way. Putting the muscle behind the name with a Universal 120v Electric Motor and High Pressure Axial pump delivering a flow rate of 1.4 GPM. Engineered for longevity and stability thanks to our Total Stop System (TSS) and wide track wheels for great manoeuverability. PressureJet can handle any cleaning job from siding and windows to stripping paint or power washing vehicles. Our machines are built to out perform and outlast the competition. A perfect synergy of performance and style, the PressureJet pressure washer delivers the power you need to tackle any residential or commercial cleaning job. Putting the muscle behind the name is the proven strength of engines from Honda or Briggs & Stratton and an axial pump from Annovi-Reverberi. An innovative motorsports-inspired chassis design gives this pressure washer a muscle car cool factor! Engineered for comfort and stability thanks to our anti-vibration system (PAVS), the ergonomic design includes a premium welded roll cage frame and oversized wheels for great maneuverability. PowerPlay washers can handle any cleaning job from siding and windows to stripping paint or power washing vehicles. 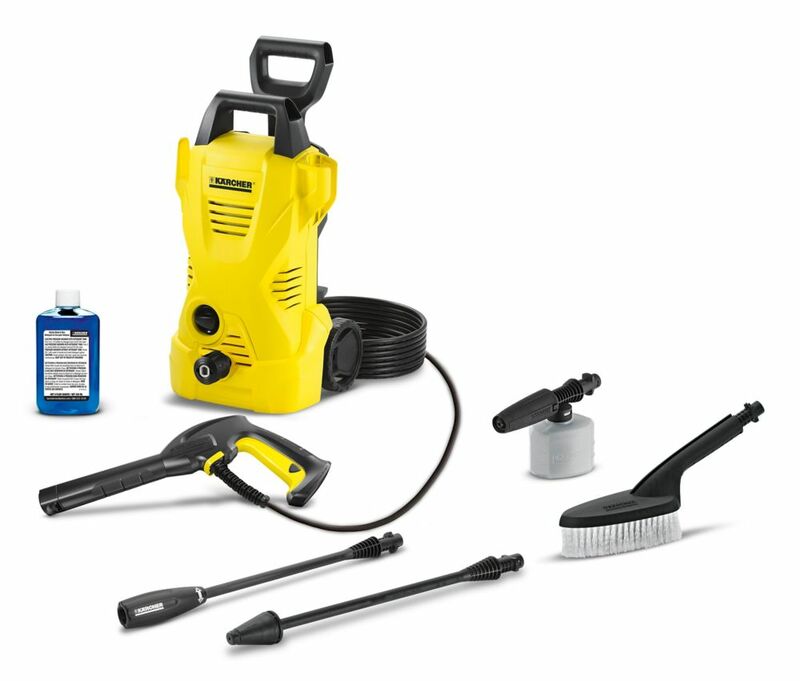 K2 Car Care Kit Electric Pressure Washer 1600PSI 1.25GPM is rated 4.5 out of 5 by 6. Rated 5 out of 5 by HomeDepotCustomer from Wanted a power wash that I can use . I... Wanted a power wash that I can use . I found it. Easy to use and packs a lot of power. Rated 3 out of 5 by drrocky from I have had the power washer for about a month with it being used for at least 3-4 hours each week... I have had the power washer for about a month with it being used for at least 3-4 hours each weekend. I also lent it to family members to use but the plastics attachments did not fair very well. I have already had to tape where the water hose connects to the pressure washer. I am going to need to take it back to home depot as it is not durable enough! Rated 4 out of 5 by Gary from P-washer The pressure washer works very well, but then I have only used it one time. It,s easy to setup and esay to move around. The pressure is just fine for cleaning sidewalks, driveway and the house. I have it in my workshop, which is very small, but it doesn,t take up a lot of room and is easy to walk around.